Here's a behind the scenes look at the process for creating part of a panel in The Moon Prince (it's actually a bit of a teaser since it's from a page that hasn't been published yet!). 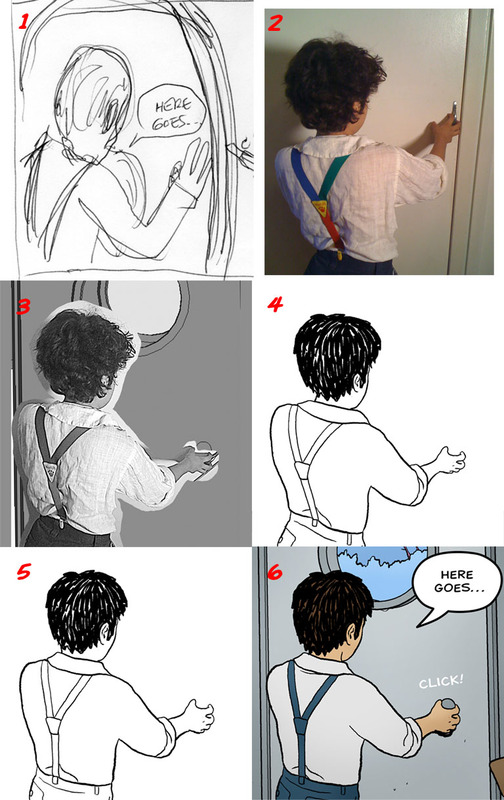 The image starts with a quick rough sketch, as shown in image #1 the grid below, then I shoot a reference photo (image #2) using a model (in this case, it's my son, Max). Next, I make a collage using the photo and a 3D rendering of the background (#3). Then I make a drawing based on the photo (#4) -- and here's where things get a little tricky. Drawings based on photographs often look awful - they're frequently distorted because of the camera lens or perspective, and details that look just fine in a photo can look strange or awkward in a drawing. To fix this, I use the Liquify filter in Adobe Photoshop, which allows me to smoosh the drawing around to my heart's content until everything looks "right" to me (#5). Then I add texts, background drawing and color to finish up (#6). To make it easier to see how Liquifying works, I made a little animated gif that cycles between image #4 and #5. For anyone used to drawing comics the traditional way - with ink on paper - altering a drawing this way probably seems weirdly reversed, because it treats a "tight" ink drawing as though it was still "loose" pencils, making the end of the drawing process seem more like the beginning!